In announcing Abu Dhabi’s largest housing development for Emiratis, developer Modon Properties also revealed details about the extensive research it has done on the features that make a happy and comfortable home. Modon’s Riyadh City is so named as a tribute to the UAE’s strong ties with its next-door neighbour Saudi Arabia. Apart from its symbolic status, Riyadh City is a housing development with lofty ambitions. Located between north Wathba and south Shamkha, Riyadh City is some 30km from the city centre, but residents don’t have to worry about living so far away – like most “mini cities” being developed across the country, Riyadh City will offer all amenities that residents will need, from health care facilities and schools to shopping centres and leisure destinations. But of course, this being a mainly housing development, the residences themselves are the crown jewels of Riyadh City. And to make sure the houses match the needs of residents, Modon conducted a nationwide survey, which it called the Build Your Happiness survey, wherein Emiratis were asked questions about their ideal homes. Almost all of the respondents were in the 25-45 age bracket, which mainly comprises those with young families as well as growing households. The survey revealed interesting results; for instance, a majority of respondents preferred a modern design as opposed to a traditional layout. “The main objective of this survey is to understand the housing needs of the modern-day Emirati family,” explains Abdulla Al Sahi, CEO of Modon. Al Sahi said the survey provided a good starting point in designing the villas and choosing the right mix of amenities. Riyadh City will occupy 8,000 hectares, equivalent to 40 times the area of Downtown Dubai. There will be 26,000 plots available for villa development — putting this in context, Modon says this will increase Abu Dhabi’s residential area by 45 per cent. Emiratis can acquire the plots through a loan from the Abu Dhabi Housing Authority. Plot owners can build their own homes, but according to Modon 65 per cent of respondents don’t want to go through the trouble of construction – they want Modon to build it for them. 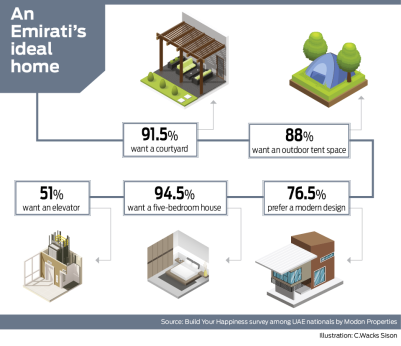 “The idea is to offer Emiratis a one-stop shop for the building of their homes, so they don’t have to deal with third parties, be it a construction consultant or a contractor,” says Al Sahi.